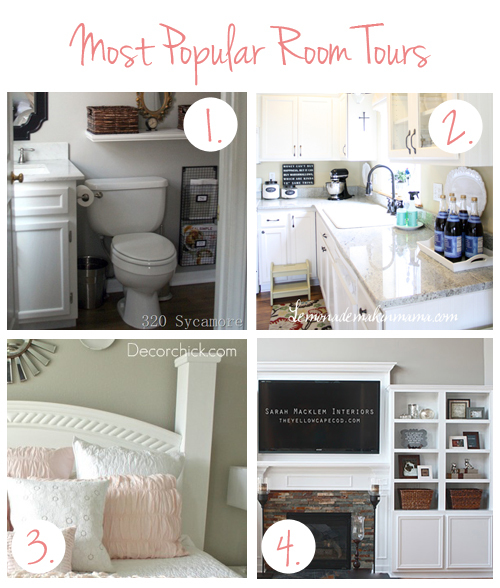 Just for fun this weekend, I thought I would feature the top four blogger Room Tours from the past year, in no particular order! PS. I’ve been a wee bit of an absent blogger this week because I’ve been a busy busy bee around my house! I’ve made quite a bit of progress on my office! Honestly, I am about to burst with happiness, I love it SO MUCH! I’m so happy with how it is coming together. More posts to come! Have fun touring these rooms! Check out more awesome Room Tours here! I have had quite a few confessions from readers in the past year sharing that while they love photos of white rooms and painted white cabinets, many actually live with more wood, contrast and color. While I agree that all light and tone-on-tone rooms are certainly pretty in a picture (they do tend to photograph well) there are many of us that still love color and contrasts between white and wood in our own homes. There should be room for all of us to live with our own style and unique homes. Of course, just because I’m still a fan of wood doesn’t mean I always keep it natural wood. 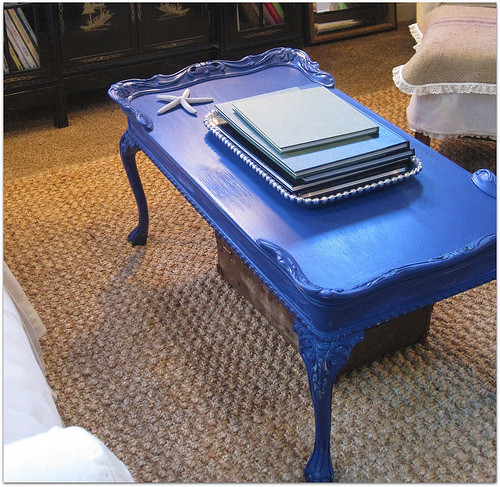 I painted this little formerly wood table blue a couple of years ago and it has been happier ever since. And I’ve painted furniture white too, like my table! I’m not anti-painting, obviously. But sometimes natural wood is best. You can definitely overdo dark wood and end up with a dreary outdated home, of course, but I believe you can lighten and brighten your style in many ways and still keep some dark pieces. You don’t have to have all light furniture and walls to accomplish a lighter feel in a home. It all depends on the room, the styling and what other pieces you have in your home! To me it is often about the mix. I happen to love eclectic styles and contrasts between light and dark, so a few darker wood pieces work for me in the overall mix of my home’s decor. I have so much white furniture, blondish wood floors in parts of my house and white woodwork, my house can handle some dark pieces to ground things a bit. 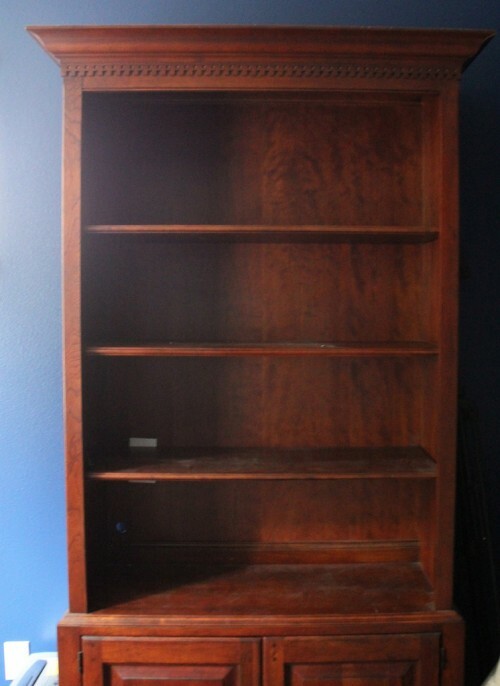 So if you happen to have a dark wood bookcase or open cabinet in your home (like I do, eh hem) and you want (or need) to keep it but want to lighten things up a bit, you CAN work with a dark piece and lighten it up without paint! 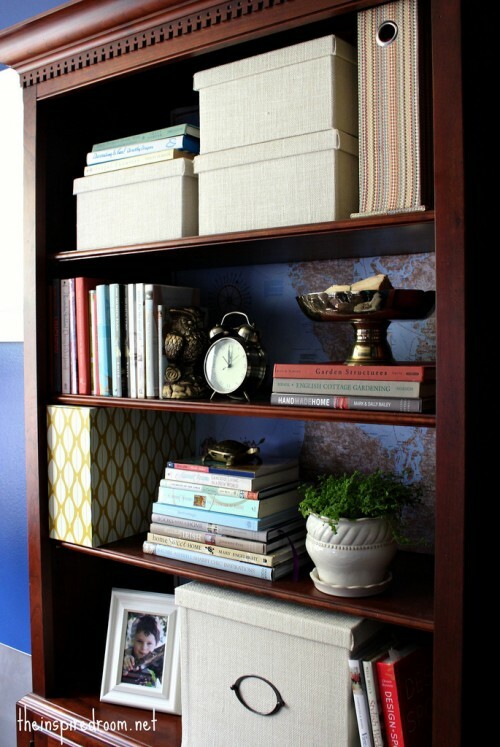 And this would definitely be a great solution for built-ins too if you are a renter and don’t want to paint! For my “bookshelf makeover without paint” in my home office makeover (which is still in process!) I added a pretty but subtle map to the back of my shelves. I had bought the map last week when I was out of town not knowing what I was going to do with it! It is a map of the NW Coast, from my old hometown of Portland, Oregon all the way up the coast of Washington. I love using things that have meaning, so this map was perfect for us. I didn’t want too much pattern or color as it would have fought with my accessories, so I was glad that this map had some color but would blend into the backdrop and let my accessories shine. It is completely removable (I just taped it to the back of the cabinet) should I decide to change it later or as my room evolves! Then to finish the bookcase styling I added some light IKEA linen storage baskets for all those unsightly office items, along with some of my favorite books and accessories from around my house. 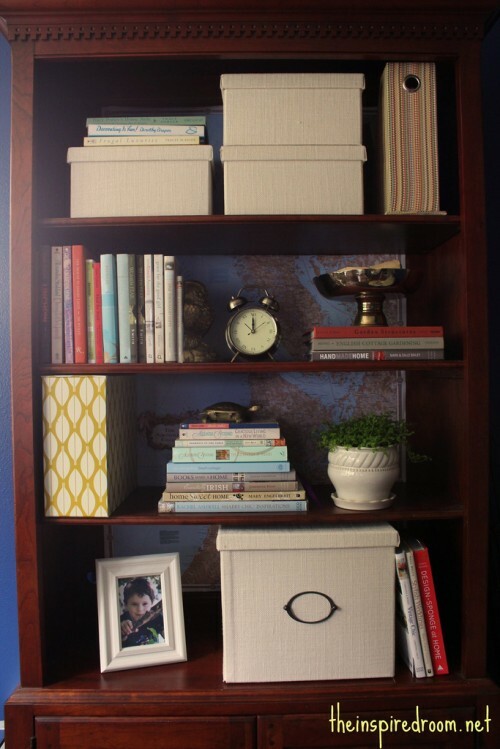 The whole piece felt much lighter after its style makeover and ended up tying in well with the rest of my decor. No need to get rid of something that still works! While I may eventually decide to get something new (I always reserve the right to change my mind! ), it is nice to have the option to keep a piece of furniture and not feel like I HAVE to paint it or get rid of it in order to be happy. I love using what I already have, finding contentment with things I already own, and saving myself some work too! Did you see my new home office tufted “girl chairs”?